Satellite dish pointing angle calculator. In this example, the satellite dish reflector is circular, with feed on centreline. The beam is at right angles to the dish backing structure ring. Identify your latitude from a map or GPS receiver. North of the equator latitude is positive, the further away from the equator the greater the number. South latitudes are negative. Work it out as a decimal number. There are 60 minutes in a degree. Go to the satellite TV angle calculator and input your latitude. You can input zeros for the longitude of your site and the orbit longitude of the satellite, since longitude is irrelevant to the setting up of a polar mount. You are only interested in pre-calculating the polar mount main axis angle and the polar mount dish offset tilt angle. 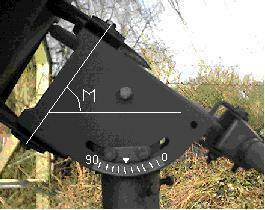 Set the polar mount main axis angle using the scale in Fig 2 above. You can check the angle with an inclinometer applied to the metal edge that is parallel with the main axis. 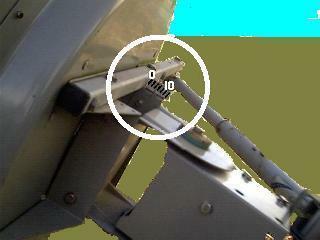 Set the polar mount dish offset tilt angle using the small scale at the top, shown in Fig 1. Having set the two angles really carefully, centre the actuator and point the whole head assembly to due south by rotating the canister on the pipe at the bottom.